If your nationality is not listed, you will need to contact an Australian embassy or the Department of Immigration to obtain your visa. *British protected persons, British subjects, and British overseas citizens should apply for a subclass 600 visa, and are not eligible for an ETA at this time. An Electronic Travel Authority (ETA) provides authorization to travel to and enter Australia and is electronically linked to your passport. It is for short term stays for tourism or business visitor activities. Business visitor activities do not include work. If you want to do short-term, highly specialized, non-​ongoing work in Australia, you can apply for a Temporary Work (Short Stay Activity) visa (Subclass 400). When should you apply for an Australian visa? You should apply no later than 24 hours in advance of your departure. On occasion, some people are not approved to enter Australia and they must contact an Australian embassy. An ETA is required for people who want to visit Australia for tourism or business purposes. Many nationalities are eligible for this electronic visa. Please see our list of ETA nationalities on the ‘ETA Eligible Countries’ tab on this page. Should your nationality not be listed, you will need to contact your nearest Australian embassy or the Australian Department of Immigration for alternate visa options. Tourist Visa (ETA 601-T): $20 USD (or your currency equivalent). Business Visa (ETA 601-B): $30 USD (or your currency equivalent). ***No taxes, fees, or surcharges apply. Visas are typically processed and approved within a few hours. This is dependent on your time zone and the time of day the application is submitted, it can take up to a maximum 24 hours. Expedited processing is available for a surcharge of $50USD per applicant, you will receive an answer in under 1 hour. You must not have any criminal convictions for which the sentence or sentences (whether served or not) are for a total period of 12 months duration or more at the time of travel to Australia. If you do have criminal convictions, then you must apply for a subclass 600 tourist visa. Apply Here. How much validity does my Passport need? All visitors require at least 6 months validity on their passport. If you passport is about to expire (within 6 months), you should check with an Australian embassy to see if you are still allowed to visit the country. 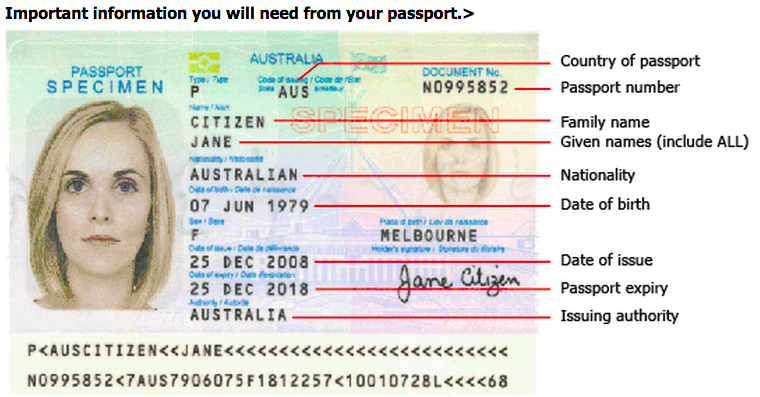 You may need to obtain a new passport prior to traveling to Australia. An ETA is valid for 12 months from the date it is granted or the expiry date of your passport, whichever comes first. Note: You will need to apply for a new Australian Visa if your passport expires and you are issued a new passport. Can I choose which date my visa will be active? No. Once your ETA Visa is issued it will be active and valid for 12 months. Your 3 month visit will need to begin within that 12 month period. It does not matter how far in advance you apply for your ETA visa, so long as you plan on entering Australia within 12 months of your application date. Can I work in Australia on my ETA visa? Can I stay in Australia past the date on my ETA confirmation? Yes, you may stay beyond the expiration date listed on your ETA visa, however you may not stay longer than 3 months in Australia at any one time. You must enter the country of Australia by the date listed on your visa, otherwise, a new visa is required. Do I have a current visa? Visas are valid for 12 months from the date they are issued. If you are uncertain if you already have an existing visa, then you can apply for a new ETA, as a new request for a visa will override any existing 3-month tourist or business ETA visa. Note: If your existing visa is a long-term visa (6-12 months+), a work visa, a student visa, or any other visa which permits more than 3 months of tourist activity, then an ETA will not override your existing visa. Where is my ETA expiration date listed? You can find the expiration date on the visa approval email confirmation. Listed in the upper half of the visa approval, it will say “Authority to Enter Australia Until…“ That date listed is the last day in which you can enter Australia. Once you have entered Australia, you may stay for 3 months, even if it stretches beyond this expiration date. I have a new passport, do I need a new Visa? Yes, anytime a new passport is issued to you, whether your visa was lost, stolen, or expired, a new visa needs to be issued. Amendments cannot be made to existing visas to accommodate the new passport. Do I need a confirmed air ticket to purchase my ETA? No. You are not required to have booked your transportation into the country before applying for an ETA. It is okay to apply for your ETA anytime before or after your flights are confirmed. Please apply for your ETA Visa a minimum of 24hrs prior to departure to allow for processing. Will the airline know if I have an approved ETA? Airlines, travel agents, cruise companies, and immigration officials all have similar systems which allow them to run an inquiry on your visa status. Once you are approved by response from this website, all of your name and passport information will then be active and valid in the Electronic Travel Authority immigration system. The airline or cruise company will then swipe your passport at check-in, electronically verifying your visa status in the ETA system. Will I need an ETA to transit through Australia? If your stay in Australia is longer than 72 hours, you will need to apply for a tourist visa (ETA). If you are simply transiting through the airport, you do not need a transit visa. Please visit the Australian Department of Immigration website, which lists more transit visa information. Do children and Infants require ETA Visa's? Yes. Children of all ages, who are traveling with you, will need to obtain a visa. Can I leave and return to Australia using the same ETA? Can I stay in Australia longer than 3 months? You will need to apply for a visa which allows for a longer stay (6-12 months) from your nearest Australian migrant office. A Tourist Visa (subclass 600) may be a good alternative if you plan on staying longer than 90 days in the country, but you will have to pay a higher premium. If you think it’s unlikely that you will stay in the country longer than 3 months, then you can also start with an ETA, then apply for a Tourist Visa extension (subclass 600) and extend your stay while in Australia. Just keep in mind that pricing and rules are subject to change.